We are a collective of nature lovers, motivated to promote rich and meaningful experiences in Portugal's natural spots. Our mission is to nurture and encourage a long-lasting, conscious and valuable relationship between people and nature. Through this meaningful bond, we aim to promote personal and collective well-being and also to support the appreciation and conservation of the natural world and its protected areas. We aspire to be an important agent in the "Portuguese green revolution", inspiring people to connect more and more with nature. We also look forward to being recognized as a reliable and central figure in the sustainability scene in Portugal. Studies show that exposure to natural environments tends to improve our mental well-being. Anxiety and depression have become a global epidemic and this approach emerges as a valuable tool for interaction with the natural areas, which have so much potential to favor our mental clarity. It is the ability to bring one’s own attention and focus onto the experiences of the present moment, through certain practices and techniques, as meditation, for example. In an ever more fast paced world, it should be an essential and vital part of our lives, promoting overall a greater well-being and perceived health. It is described as "responsible travel to natural areas that conserves the environment, sustains the well-being of the local people, and involves interpretation and education". It’s a sustainable way of travelling that benefits all involved parts – tourists, local communities and nature. Because in order to care about something we first have to know it and understand it, we always promote the interpretation of the places we visit. Through an ecological approach our team biologists provide information about the fauna and flora while raising awareness for conservation issues. Fascinated by the natural world and focused on causes such as cultural exchange and sustainability, João is the founder of Breathe Portugal. Graduated in Marketing, he believes that the fusion of spirituality and science brings enormous potential to generate new and more effective local solutions to global challenges. Graduated in Psychology and trained yoga teacher by Sivananda Yoga Vedanta in India, Maria guides group activities and dynamics based on the concept of mindfulness. Her introspective approach aims to promote a deeper and a more meaningful connection to the world around us and to ourselves. 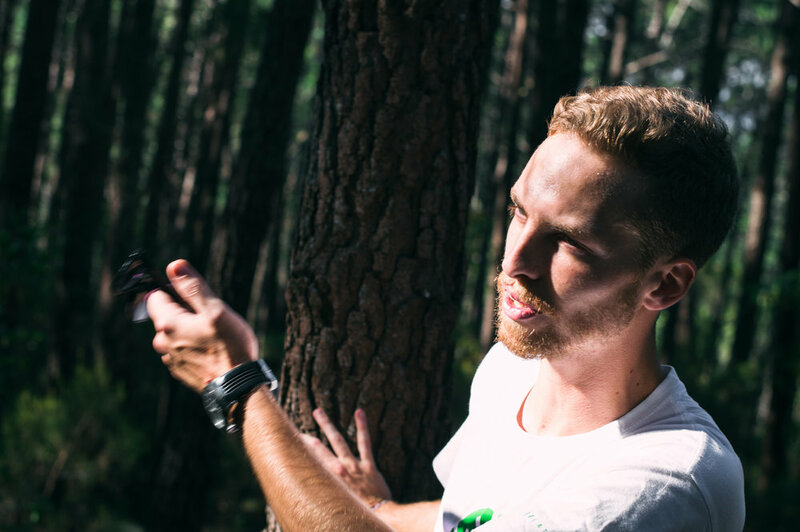 He is one of Breathe's Biologist and his love for the environment and people drives his quest. Currently working in environmental management, he brings an ecological and educational approach to our events, always adressing and raising the awareness to conservation issues. Breathe photographer, Vasco is in charge of documenting the experiences, moments and emotions lived along the tours. A trained biologist and wildlife enthusiast, he has some experience in the field as a group monitor, having developed several skills, including orientation and first aid.